PALM HARBOR, Fla. -- A few years ago, Lansbrook Golf Club was one of the dark sheep in the Tampa golf scene. 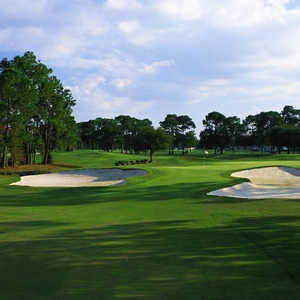 Ron Garl's redesign made Lansbrook Golf Club one of the nicer courses in the Tampa Bay area. It wasn't pretty, it wasn't in great shape, and was disparaged by many Tampa golfers. Things have changed since architect Ron Garl took over and redesigned the course, making this 6,846-yarder one of the nicer ones in the Tampa Bay area. With tree lined fairways and water that comes into play on most holes, Lansbrook is a challenging course that rewards players who can shape their shots. It's also got a unique feature that you don't find at many golf courses. At the first hole, the Stimpmeter measurement is listed. For whatever reason, most courses don't tell you the stimp reading, and some don't want to, but Lansbrook Golf Club does. The tight layout means it might be a good idea to keep the driver in the bag and play it safe. The course isn't a long one, so a 3-wood off the tee is usually the best bet. Also, with water on 16 holes, playing it safe is essential. That's not the only positive thing about Lansbrook. Garl was brought in to refurbish the golf course, originally designed by Lane Marshall, and new management took over about two years ago. The result is a clean course with plenty to offer, even if it is a bit out of the way of downtown Tampa. 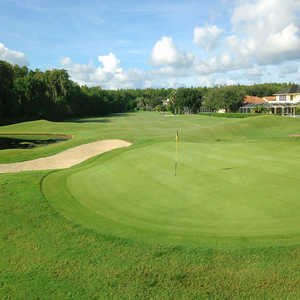 "It's a tough course and it's in great shape now," Director of Golf Greg Folsom said. "We worked hard on it and it's one of the great courses in this area." The first hole is a tough way to start the round. At 410 yards, it doesn't require a bomb off the tee, but don't try to get too close off the tee. There's a severe dogleg left with water on the right, A drive through the fairway will be wet, but the approach shot to a green with bunkers on the right but generous on the left, is an easy short iron. Lansbrook Golf Club's second hole is more of the same with water all the way down the right side of the 492-yard par 5 and the third hole, a 180-yard par three requires a long carry over water to a green surrounded by bunkers. The toughest handicap hole on the course is no. 5, a 440-yard par 4 that looks relatively tame, unless you can't keep the drive down the middle. It's as close to a U.S. Open-tight fairway as you'll find in Florida. As tough as it is, though, it is one of the few holes at Lansbrook where water really doesn't come into play. Lansbrook also offers a benefit that is starting to catch on at golf courses everywhere. You can call the snack bar for some food and beverages and have them waiting for you at the turn. More and more courses are offering that feature, but Lansbrook offers a nice selection, including a full liquor bar. The back nine is shorter, but look out for the closing holes. The 580-yard 16th is perfectly straight with water all the way down the right side, with more of Lansbrook's trademark tight fairways. After a docile par 3 17th, the closing hole is a 378-yard par 4 that bends around a lake to a bunker-guarded green. If you are from out of town, bring a camera if play is light. You will see plenty of deer and even some alligators. "This was fun," said Mike Sando, a visitor from Orlando. "It's a little bit out of the way, but there it was definitely challenging. "I kept the big stick in the bag because I only brought two sleeves of golf balls." 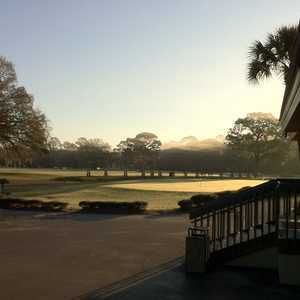 Lansbrook Golf Club is a great golf outing for the locals, but it may not be worth a day out of a golf junket to Tampa. It's a tough course that has teeth, and it's a good bargain with great customer service, but you might not want to plan an entire vacation around it.